After a hugely successful campaign with Lagavulin in 2016, Diageo and Condiment Junkie returned to East City Films to help them create The Singleton of Glen Ord Sensorium. The idea was to create an immersive experience that takes people to the Glen Ord distillery in the Northern Highlands of Scotland, where they get to see how the whisky is made, taste the whisky itself and even touch and smell the barley. The environment itself was provided by Igloo Vision, with East City Films providing the visuals and Condiment Junkie delivering the surround sound soundscape. 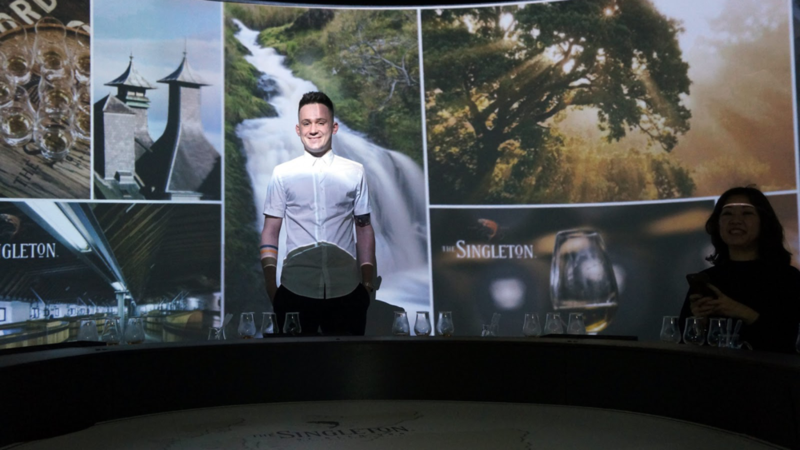 The Singleton of Glen Ord Sensorium opened its doors in Hong Kong at the Taste of Hong Kong as a gigantic whisky cask, and saw hundreds of visitors experience the provenance of this beautiful whisky. Filmed using a Fuji XT2 with Zeiss lens and a nodal technique developed to deliver the highest resolution and best picture quality possible, our team captured scenes from the still house to the the nearby Loch nan Eun, immersing people in the birthplace and spirit of the whisky. Stitched and edited in our studio in London using optical flow techniques, we created multiple scenes with surround sound created by Condiment Junkie. We also worked with VFX house MyLiaison to create three stunning CGI scenes which reflected the tasting notes of the whisky. The final content was delivered as 360 video at 8K to play in the Igloo at the highest possible quality.